FOR PRIMADÉLI CAKES TO BE DELIVERED STRAIGHT TO YOUR DOORSTEP, ALL YOU HAVE TO DO IS DIAL 6276 3333! Delivery is available daily, to anywhere in Singapore*! It's the perfect solution for everyone, even if you are in a holiday chalet in Changi or the office in Tuas! *Exclude delivery to BBQ pits, carparks, Jurong Island and islands of Singapore e.g. St John's Island, Pulau Ubin etc. Kindly read all terms and conditions before ordering. 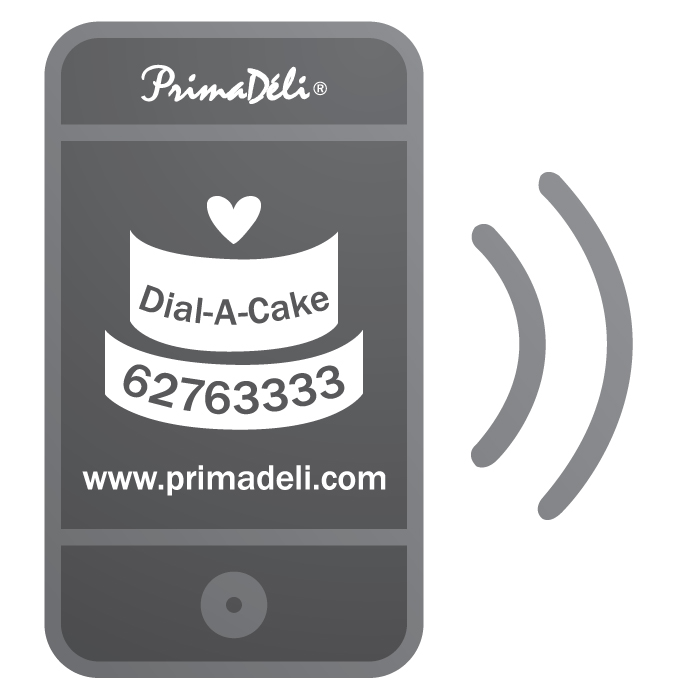 Place your orders through the Dial-A-Cake Hotline at 6276 3333 (8.30 am - 5.00 pm Mon - Sun) or www.primadeli.com or any PrimaDé́li outlet. Please place your delivery orders at least 48 hours in advance before delivery time. For peak seasons like Mother's Day or Christmas Day, it is advisable to place your orders as early as possible. Items on promotion are valid provided the minimum order requirement (Amount stated in above table) is satisfied (Valid for orders place at PrimaDé́li outlet only). PrimaDé́li reserves the right to accept or reject any orders, including request for specific timing. 3 days prior to Mid-Autumn Festival, Mid-Autumn Festival, 3 days prior to Christmas Day, Christmas Day. *No delivery during Chinese New Year (from Chinese New Year's Eve to the third day of Chinese New Year). **Additional $10 delivery charge + normal delivery charge will be added for delivery to Marina Bay Sands area including Gardens by the Bay or Sentosa. Delivery charges are based on one destination. Delivery is free for orders exceeding $120 nett per destination, but it is not available 7 days prior to actual day of festival (ie. Chinese New Year, Mother's Day, Mid-Autumn Festival & Christmas Day). Delivery timing will be subjected to changes during festive periods. Specific timing charge & Surcharge delivery to MBS including Gardens by the Bay or Sentosa will still be applicable for orders exceeding $120 nett per destination. Specific timing is subjected to 1 hour allowance and availability, but it is not available 7 days prior to actual day of festival (ie. Chinese New Year, Mother's Day, Mid-Autumn Festival & Christmas Day). Payment must be made in full upon ordering. Only Visa, MasterCard or American Express will be accepted. Prices quoted are based on standard cake flavours (chocolate or vanilla) and are inclusive of GST. Extra charges will be imposed accordingly for changes made to choice of fillings, shape or colour. Discount coupons and privilege cards including the Prima Privilege Card are not valid for delivery orders unless otherwise indicated. Extra charges will be imposed for changing shape of cake and to have additional filling. Choice of standard sponge flavours (chocolate or vanilla) is available. Not applicable to the following cake design codes : PF, PC, PT, PM & P.
No cancellation or amendments are allowed 48 hours before delivery date or collection time. - A 50% cancellation charge will be imposed if request for cancellation is submitted 48 hours to 72 hours before date of delivery or collection time. - A $5.00 cancellation charge will be imposed for cancellation request submitted more than 72 hours before date of delivery (except for customised cakes). - A $5.00 amendment charge will be imposed for each and every request for amendment. - All amendment requests must be submitted at least 48 hours before date of delivery or collection time. In the event that there is no one at home/office to receive the cake, the cake will be sent to the nearest PrimaDé́li outlet for self-collection by the customer. Delivery charge will be non- refundable. All uncollected items will be disposed 48 hours after scheduled collection time. Cakes delivered must be checked and shall be deemed accepted if no errors or discrepancies are raised immediately upon delivery. PrimaDé́li reserves the right not to entertain any further complaints thereafter. PrimaDeli endeavours to fulfil the deliveries straight to your doorstep. However, PrimaDeli shall not be liable or responsible in any way for any late delivery or failure to deliver the cakes due to unforeseen circumstances such as vehicle breakdowns, traffic congestions, bad weather, road accidents, road works or disasters. PrimaDé́li reserves the right to change the delivery timing. We deliver to all locations within Singapore except BBQ pits, Carparks, Jurong Island & Islands of Singapore eg. St. John Island, Pulau Ubin etc.